GURPS High-Tech has moved out of the "editing" phase of its lifecycle, and has entered "art." During the early part of this stage, the raw text was poured into a Quark template, and art holes were identified. Those art holes are now being filled with cool art designed to help readers visualize the information more clearly. 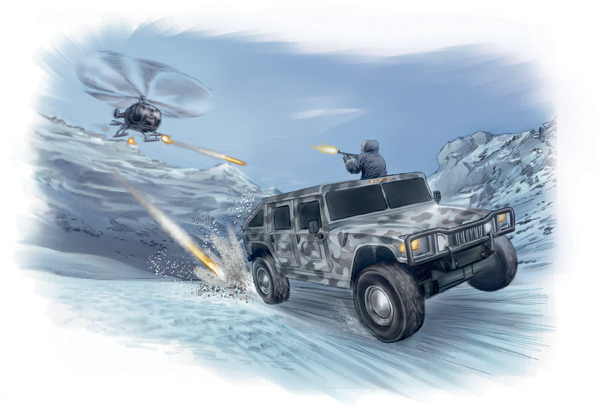 The picture here is from Chapter 8, which covers transportation, from kayaks to motorcycles, as well as helicopters and the HMMWV. GURPS High-Tech is another "overweight" project – the topic was just too big, and the authors wrote too much awesome description (is that possible?) that we needed to up the page count from our standard 240 pages, up to 256. Watch for it around the end of the year.